In my dissertation I offer a philosophical analysis of gravitational wave astrophysics - a field recently launched by LIGO's "direct detection" of gravitational waves, and "direct observation" of compact binary mergers. My project has three parts. In the first part, I examine the nature of our empirical access to black holes, through an attempt to clarify and adjudicate the controversy about whether the first LIGO detection, GW150914, constituted a "direct detection" of gravitational waves and a "direct observation" of a binary black hole merger. In the second part, I raise a worry about the methodology of LIGO, conceived of as an observatory of compact binary mergers. I argue that there is a problematic circularity in how we make inferences about the properties of these binaries. This is because we cannot know that we have good models/simulations of binary black hole mergers without accurate and precise measurements of their properties, but our success in obtaining such measurements of binary black holes depends on having good models/simulations of black holes to utilize. In the third part, I consider the implications of the first two parts for astrophysics. For example, I analyze what role multi-messenger astronomy might play in addressing the concerns of part two. I assess the extent to which different "windows" used to observe the universe are genuinely independent, and consider the epistemic significance of observing through complementary windows in astrophysics. 2017: "Modelling Black Hole Coalescence: Numerical Relativity and LIGO" at the "Super-PAC" early career workshop in philosophy of astrophysics and cosmology. 2017: "Drama on the Horizon: Black Holes, Information Loss, and Complementarity" at BSPS 2017, Edinburgh. 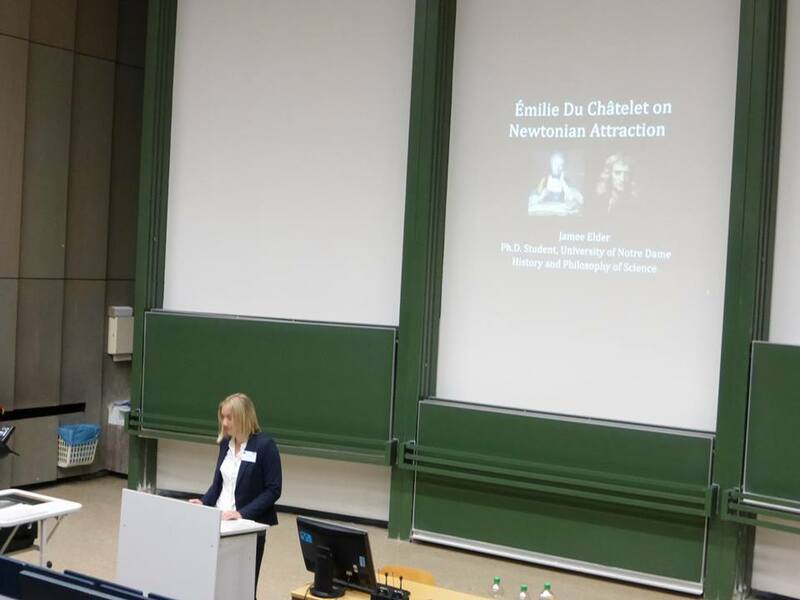 2015: (left) "Émilie Du Châtelet on Newtonian Attraction" at EPSA 2015 as part of a symposium on "Émilie Du Châtelet's Institutions de Physique" featuring (right) fellow Notre Dame graduate students Aaron Wells, Monica Solomon, John Hanson, and Jeremy Steeger. A full English translation of the Institutions is available here, through Katherine Brading's website.